Before you begin trading, you need to decide which cryptocurrencies to trade. Approximately 2,100 cryptos are currently in use throughout the world. The ability to select cryptos that are best suitable for active trading is especially important for aspiring traders. Different cryptos have different characteristics of trend, volatility and liquidity. Some cryptocurrency pairs are quoted in U.S. Dollars, whereas others are quoted in Bitcoins. Some are being traded as digital currencies, whereas others are listed as derivative contracts. Undoubtedly, certain cryptos are of greater interest to short-term traders, whereas, others are more suitable for long-term investors. In this article we discuss the place of cryptos, as a new asset class, in the world of trading, and identify the top 5 cryptocurrency pairs that are best suitable for active trading. Cryptocurrencies represent a new asset class, whose combined market cap has been growing extremely fast over the past five years. Cryptos are decentralized monies. Decentralization implies that cryptos are not issued by national monetary authorities, as compared to traditional currencies. Instead, they are issued and operated by the decentralized blockchain networks. Certain advantages of cryptos make trading in crypto markets more profitable to active traders, as compared to forex and stock trading. From a perspective of a short-term trader, the most actively traded cryptos are the top coins to trade. The top 5 most actively traded and liquid cryptos are Bitcoin, Ripple, Ethereum, Bitcoin Cash, and Litecoin. These instruments are generally regarded as primary cryptocurrencies. The major advantages of these cryptos are moderate volatility and strong price trends. Before you begin trading, you should review the top 5 most liquid cryptos for the presence of a strong price trend. When you identify a particular crypto with a strong price trend - that will be your most suitable instrument for trading on a particular day. The concept of a trend is perhaps the most important aspect of trading. The ability to identify a trend early and to open market positions towards the trend is a key to success in trading. A cryptocurrency can be considered to be in an upward trend, a downward trend, or a sideways trend. 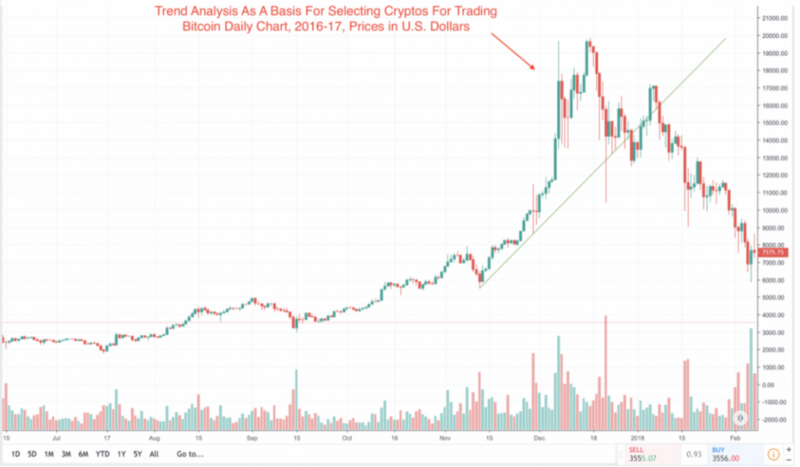 Not all cryptos are in a trend, and little useful forecasting information can be gleaned from technical analysis when a cryptocurrency is not in a trend. An uptrend for a cryptocurrency is when the price goes to higher highs and each subsequent new high is higher than the prior high. In an uptrend, the forces of demand are greater than the forces of supply. Presumably, the strong demand indicates that traders believe the value of the cryptocurrency will be increasing in the future. So, traders are willing to pay higher and higher prices for the same crypto over time, which drives its market price to new highs over and over again. Similarly, a downtrend is when a crypto makes lower lows and each subsequent new low is lower than the prior low. In a downtrend, supply is overwhelming demand. Over time, traders are willing to accept lower and lower prices to exit long positions or enter new short positions. Both motives of the sellers generally indicate deteriorating sentiment about the cryptocurrency. Therefore, you should select those cryptocurrencies, which exhibit a strong price trend. When you selected a suitable cryptocurrency, open a market position in the direction of a price trend - a long position for an upward trend or a short positions for a downward trend - and let profits grow. The picture below shows the application of trend analysis. Depicted is an uptrend line for the price of Bitcoin. Note that through 2016-2017, every rally took the Bitcoin price to a new high, whereas sell-offs stopped at increasingly higher levels. The first sign of trouble came in January 2018 when the rally terminated at a lower price point than the prior rally, of late 2018. This movement was followed by the price breaking through the trendline. Your major goal as a trader is to identify instruments that exhibit strong price trend - either upward or downward - and trade towards the direction of a trend. A cryptocurrency that exhibits a strong trend is the most suitable choice for trading. The majority of cryptos are illiquid and exhibit high volatility, which makes trading in them excessively risky. Others mostly exhibit a downward trend due to weak fundamentals and no prospects for growth, which also makes speculation in them excessively risky. Therefore, if you trade in primary cryptocurrencies, mentioned above, you will undoubtedly increase your chances of making profits. To being trading the top 5 crypto coins, you need to open a margin account. Open account at Monfex today and get access to the industry-leading cryptocurrency trading platform. It lets you trade the 5 most liquid cryptos, open long and short positions, and magnify potential gains with up to 50:1 leverage.